Sermão / Pregado / No K.K. T.T. 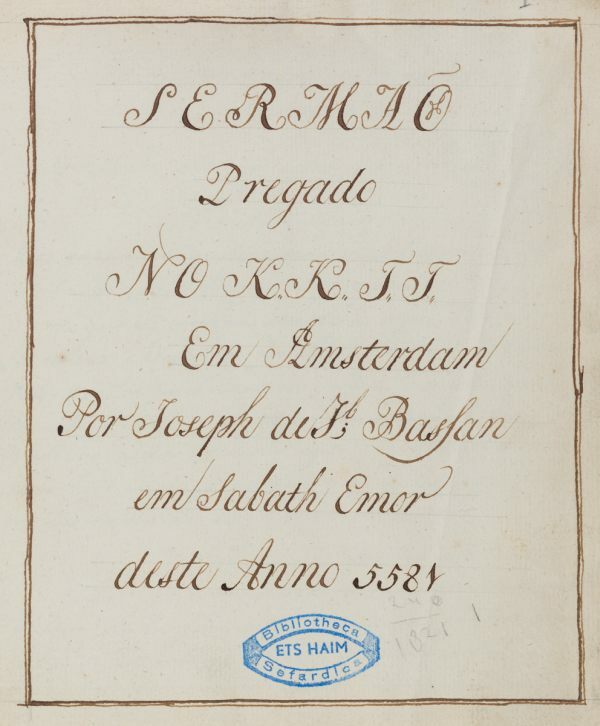 / Em Amsterdam / Por Joseph de J[aco]b Bassan / em Sabath Emor / deste Anno 5581. In this homily, the author writes about lies, using several biblical quotations. Portuguese and some Hebrew quotations / 20,6 x 16,7 cm. /  ff. (last 4 ll. blank) / 24 lines to a page / Current and Sephardic cursive writing (autograph?) / Catchwords at the bottom of each page / Contemporary paper binding. Fuks 34. Fundação Calouste Gulbenkian.